These amazing saws cut through all steels, alloys and wood. They are fast, portable, very powerful and are available in 110 volt & 240 volt. Using TCT steel cutting technology these incredible machines cut steel without heat and sparks, they leave a virtually burr free finish and do not require any coolant. Special TCT blades are available for mild steel, stainless steel, aluminium & wood. Capacity in mild steel: 6mm plate and 50mm box section or tube. Capacity in mild steel: 12mm plate and 84mm box section or tube. 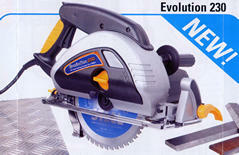 The EVOLUTION 230 has a weld preparation facility and will bevel 12mm plate and mitre 50mm box section.